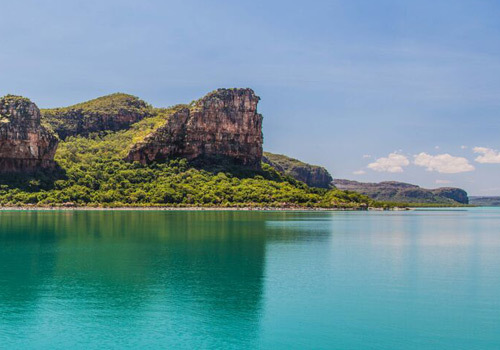 Join us for an amazing 11 day Kimberley Cruise from Darwin to Broome in 2019! Reef Prince is a custom-built 38m-expedition vessel. The advanced catamaran design ensures very quiet operation, spacious interior with phenomenal stability. Perfect for sneaking into secluded shallow bays, she draws only 1.8 meters and is powered by two quiet Mercedes diesel engines. 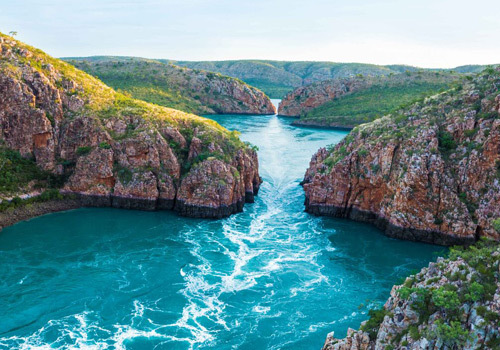 Our 2019 Darwin to Broome cruise is very popular so be sure to book early! Most excursions are via our tender vessel “Regent”. Regent is a 10 metre passenger tender that can take the whole group ashore or on expedition at the same time. With safe easy access, commentary, comfortable seating, toilet, shade plus a open area for enjoying the waterfalls. Regent is a fantastic asset to our expedition. We also have two other small vessels for those who would like to enjoy fishing, mud crabbing and exploring. 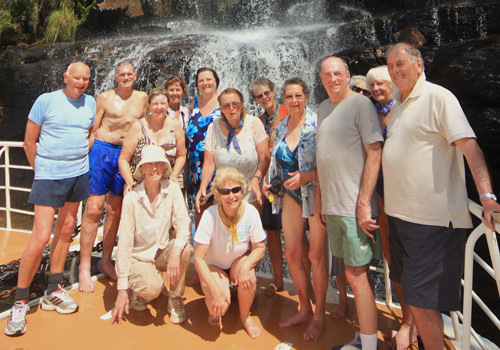 Disembarking is around 10am on the 11th day of your cruise in Broome. We organise transfers to and from the vessel. Please ensure you arrange accommodation in the Darwin CBD to have the transfers included. Pick up Darwin will be at around 8am on the morning of your departure. Disembarking with will around 10am on the 11th day of your cruise in Broome. We recommend you don’t fly until late evening or the following day to avoid missing flights and avoid fatigue. Please ensure we have all your accommodation details prior to departure. We accept cheques; cash, Master and Visa Card or you can direct debit the deposit into our account. We look forward to welcoming you aboard Reef Prince. Day 1: Welcome Aboard Reef Prince. Your Expedition begins today. 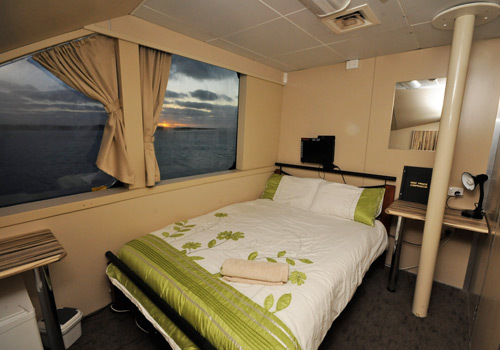 A charter coach will pick you up in the morning and transport you to board your vessel MV Reef Prince. Our crew will welcome you aboard, introduce you to your cabin and give you a detailed briefing. After a tasty morning tea we’ll wave good-bye to the city of Darwin. This evening as we steam towards the setting sun, you can meet your fellow travellers and friendly crew as you enjoy the view from the decks and the fresh sea air. Relax while the Northern Territory coastline disappears as we start our journey across the Joseph Bonaparte Gulf and sail into Western Australian waters. Day 2: Koolama Bay – The entry to King George River. Wake in the tranquil setting of Koolama Bay. Over breakfast we’ll discuss the days activities. On the high tide we’ll enter the first of the Kimberley’s ‘big’ rivers, the mighty King George. 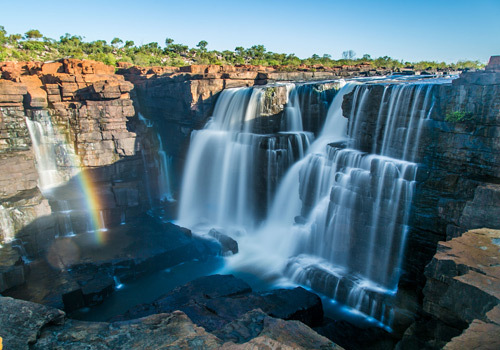 Within the King George River we’ll marvel at the soaring cliffs leading to two breath taking falls of mammoth proportions. The best views are from the upper sun deck and bow. 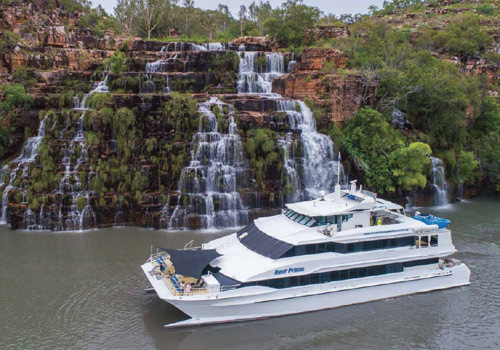 Feel the spray mist produced from billions of litres of water falling hundreds of feet as MV Reef Prince or its expedition tender is steered expertly to the majestic falls. Those after a challenge may wish to climb the escarpment to take in the views from above and take some unforgettable photographs of the vessel and falls below. Well enjoy a night anchored at the base of these perfect falls. With our movements governed by natures time keeper – the sun and moon will allow us to catch the high tide out over the sand bars. We sadly depart the amazing King George River this morning. Within Koolama Bay lies many hidden treasures for us to explore. A fascinating mangrove system brimming with life or an idyllic fresh water pool for a dip or perhaps a morning walk on the first of many isolated Kimberley Beaches. Departing Koolama we cruise through the night on calm waters to arrive at our next destination. Day 4: Jar Island & a WWII aircraft crash site. Our crew will lead you to several stunning displays of the distinctive Aboriginal rock art in beach caves. These easily accessible paintings are very early Bradshaw art, now known to be around 20,000 years old. Within Vansitart Bay lies a more recent reminder of our past. After running out of fuel on its way to Broome in 1943 a DC 3 crashed. Well go ashore to explore this well preserved site. Departing Vansittart Bay we’ll cruise west within a multitude of Kimberley Islands. We awake at the northern end of Bigge Island. When the tide allows, we can go ashore to visit a very significant aboriginal art galley on Bigge Island. Here we will discover examples of the first contact with sailing ships and pipe-smoking European seafarers of the 19th century. Keep an eye out for small rock wallabies and large salt water crocodiles. The lack of feral predators makes the Kimberley islands an ideal habitat for vulnerable mammal species. Departing Bigge Island we cruise into Prince Fredrick Harbour then further up into the Hunter River and Porosus Creek. On the low tide we can all investigate the ecosystems hidden within the mangroves and mud flats from the comfort of our 11m expedition tender – “Regent”. This ecosystem is a favourite for those who enjoy our native birds. We have a chance to spot a Great Billed Heron, White bellied sea eagle or a Chestnut Rail. For the keen fisherperson, the chance to flick a lure into the low tide run offs. 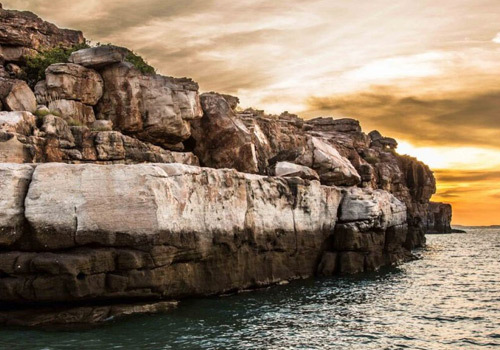 Enjoy the solitude as the Kimberley sun rise over the spectacular sandstone cliffs and invites you to share another day in Kimberley Country. This morning we move a short distance to Naturalist Island. Many try their luck in our favourite fishing patch on the incoming tide. Departing after lunch we steam for Carreening Bay. Day 7 : Prince Regent River. This afternoon opens many other option for us. We may choose to explore another hidden water fall further up the Regent or take a steep climb up the banks of the river to reveal the mysterious Aboriginal Bradshaw Paintings (Gwion Gwion), thought to be some of the world’s oldest indigenous art, dating back 20 to 60, 000 years or climb to the top of King Cascades water fall – the choice is ours. Tonight we ride the tide out of the river to anchor just off a perfect little Kimberley beach. Day 8 : The beautiful Ruby Falls following a morning walk to a scenic aboriginal art galley. Within Collier Bay lies many Kimberley gems for us to enjoy. We’ll plan our day around the huge 12m tides rising and falling every 6hrs. On the mornings low tide, after a healthy breakfast, we can stretch our legs and walk to the top of an escarpment to view a special gallery of modern Wandjina style art. 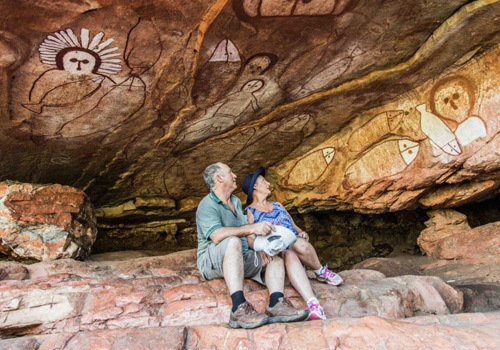 Some may like the optional Indigenous tour were local aboriginals will welcome you to their land with a smoking ceremony and ochre face painting followed by story telling and a walk to their significant cyclone cave. Register your interest upon booking. Day 9 : Montgomery Reef reveals it secrets as it ‘rises’ out of the ocean on the ebbing tide. Within the heart of Collier Bay lies 400 square kilometres of Kimberley Reef System. 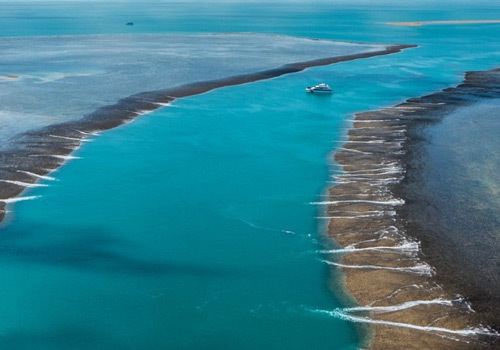 Many consider Montgomery Reef to be their most memorable experience during their Kimberley Expedition. Join a reef cruise in our expedition tender to study the marine life. Leaving Montgomery we cruise to Talbot Bay for the evening, the location of the commanding Horizontal Falls. After we drop anchor we’ll be greeted by our resident tawny nurse sharks who come for a friendly snuffle at our transom. Within Talbot Bay, the region’s 12 metre tides create an amazing spectacle. This morning we’ll experience the awesome power of the Horizontal Falls. On a trip through the falls our attention will be taken by the incredible geology that abounds this area. Our cruise director will point out the changes that have occurred in this region over the last 2000 million years to form the water ways we now enjoy. Cruising through Yampie Sound witness the effects of the iron ore mining operations on Koolan and Cockatoo Islands. Visit Crocodile Creek to enjoy a fresh water swim under a cool water fall. Finally we toast to our Kimberley Expedition and enjoy afternoon drinks as the sun sets over the Buccaneer Archipelago. Day 11: We’ve shared some amazing experiences together. We’ve made some great new friends. Unfortunately today we disembark in Broome at around 10.00am. We will arrange transfers to your hotel. To undertake some of the shore based excursions you will need to have a moderate level of fitness. You are however, quite welcome to enjoy the views from the vessel without going ashore. Please call us to discuss your requirements further.